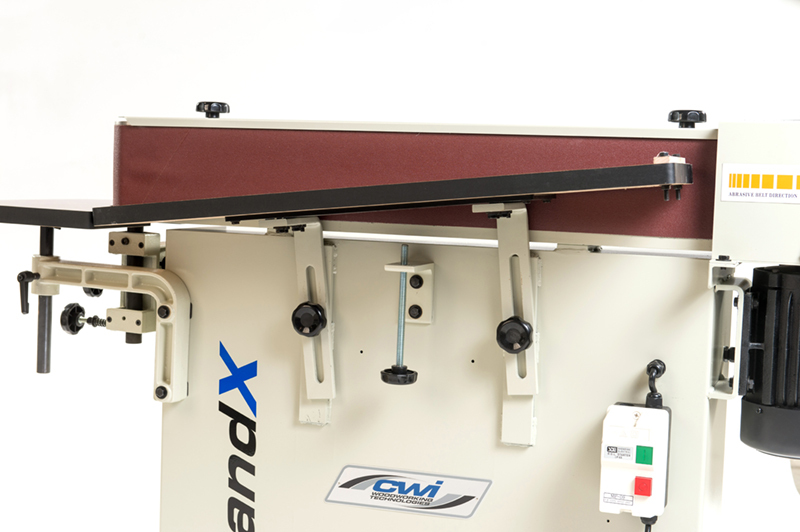 The CWI-S6108 edge sander is built for continuous commercial applications for day after day edge sanding operations. 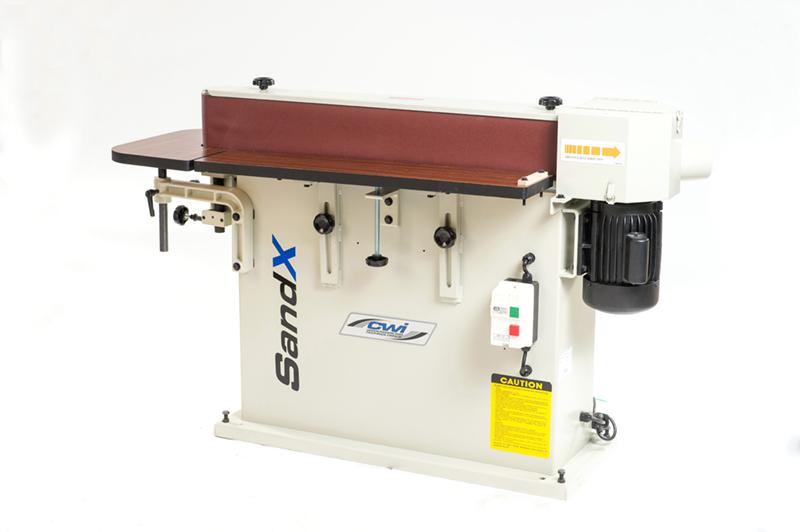 It uses a 6” x 108” extra-long sanding belt for solid wood edge cleaning, squaring, smoothing operations on drawers, doors, boxes, and of course any edges the user wishes to sand. The CWI-S6108 commercial duty edge sander has a 2 HP 220/1/60 14 amp motor and a magnetic safety switch for overload and under voltage protection. The magnetic switch is a very important upgrade for use in educational or industrial settings. The sanding belt on the CWI-S6108 runs cooler because of a graphite backing supplied along the 39” heavy steel platen underneath it. 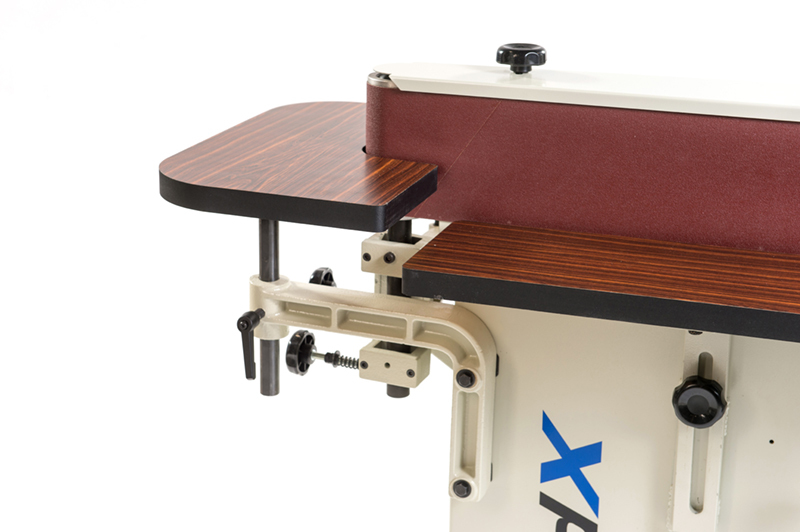 The wooden laminate work table adjusts up and down by loosening two knobs and manually lifting the work table to the height needed for the work piece or can easily be angled across the sanding belt to utilize the full width of the 6” sanding width. The sanding belt travels around a very heavy made 7” rubber powered roller driving the belt with a very strong idler assembly at the other end with a crowned 3” diameter thick walled pulley. Also included with the machine is a large wooden laminate 19” x 11.5” sanding table to allow the use of the 3” diameter sanding pulley to sand curves. The frame of the machine is a very heavy built, very stable solid steel welded stand. For adequate dust collection the SandX edge sander requires 500 CFM utilizing the 4” hose connection port on the steel hood of the machine. The hood is hinged for easy access to the sanding belt for replacement of abrasives. The SandX CWI-S6108 commercial duty edge sander is an excellent choice for woodworkers looking to do a lot of sanding in an educational or industrial setting.